I will fully admit that I ordered this burger knowing roughly what I was getting, but I have a point that I needed to make, despite having made it before and knowing that I will feel compelled to make it again in the future. This Hamburger Is Too Big. 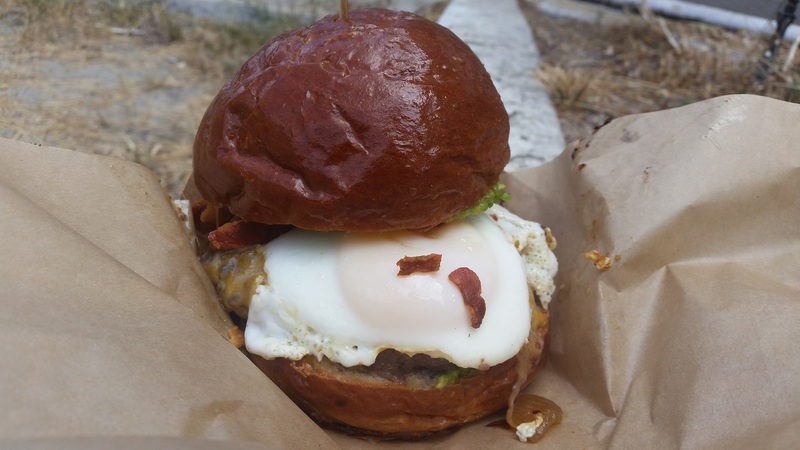 It is two patties, cheddar and jack cheese, a fried egg, guacamole, and bacon. That’s not a bad lineup, but look at the thing. It’s lopsided upon arrival, stacked so large that it cannot be consumed in any spiritually meaningful way. It’s a bite of this, and a bite of that, and then a moment chasing around everything that fell out during the previous two bites, and then a moment to wipe one’s fingers, and then a moment to sigh, and then back to the burger. Understand that this is not a categorical stance on hamburgers. One of the best sandwiches I’ve ever had was a hamburger. But something about hamburgers pushes people to go beyond the limits of good sense, and I cannot figure out what it is. I would suggest to you that that list of ingredients need not be a burger at all, but I am aware that a ground beef patty brings a savory depth some folk cannot do without. That’s fine. But why on earth are there two? I feel a bit unfair singling out the Lobos Truck here. Needless to say, this is a problem one can find in burger joints both chain and local, upscale and down, anywhere and everywhere. I don’t know where this ends, but until that day I remain perplexed and disheartened. What a fine example of the bánh mì! This being downtown Los Angeles it was also $9, a hard price for any bánh mì enthusiast to swallow, but some things can’t be helped. Unlike the last time I payed an outrageous sum for a bánh mì, though, this one was well worth the price. Long-time readers have heard me sing the praises of the bánh mì before, (at length), but allow me once again to explain what makes them so special. Good sandwiches are about harmony and balance. The ingredients have to work well together, each one contributing to a unified whole, and they must be balanced, with none contributing more than is required. The very best bánh mì demonstrate this better than any sandwich I’ve ever come across. They build around a protein, usually but not always meat, and specifically one with a deep, savory profile. The marinades involved are often boast a dozen ingredients, replete with strong flavors like lemongrass and fish sauce, but often balanced by sweeter notes. The vegetables on the sandwich, thinly sliced carrot and daikon radish, provide a crunch and an acidic tang that helps dial back the central protein. The cilantro is a bright (too bright for some) herbal note, one that I find ramps up everything behind it, and the jalapeño brings heat without throwing off the acidic or peppery notes present from the vegetables or the marinate, respectively. In short, a great bánh mì is perfect. I have sampled a great many sandwiches, and there isn’t another archetype that comes close. I wouldn’t go so far as to call the above sandwich perfect, but it was very, very good. 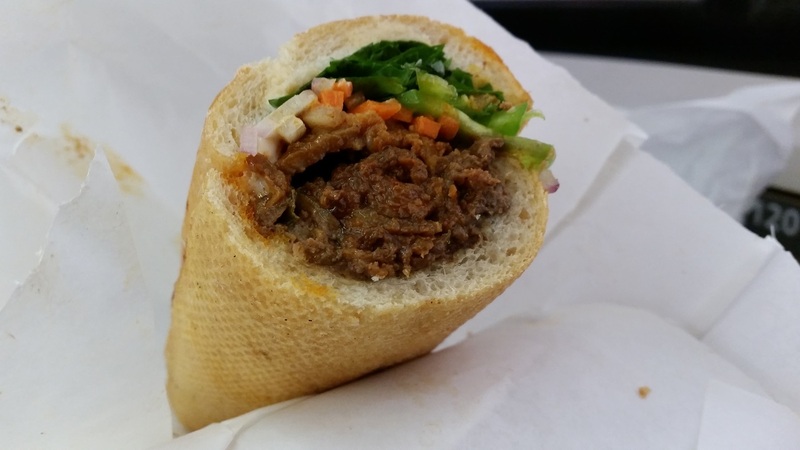 Quality pork, house-made paté, and a baguette with a good bit of tooth to it all go a long way, and when they’re going into a bánh mì there’s very little that can compare. It needed more horseradish. I have said that after literally every horseradish-containing sandwich I have ever had, and the prime rib sandwich from Simple Things is no exception. 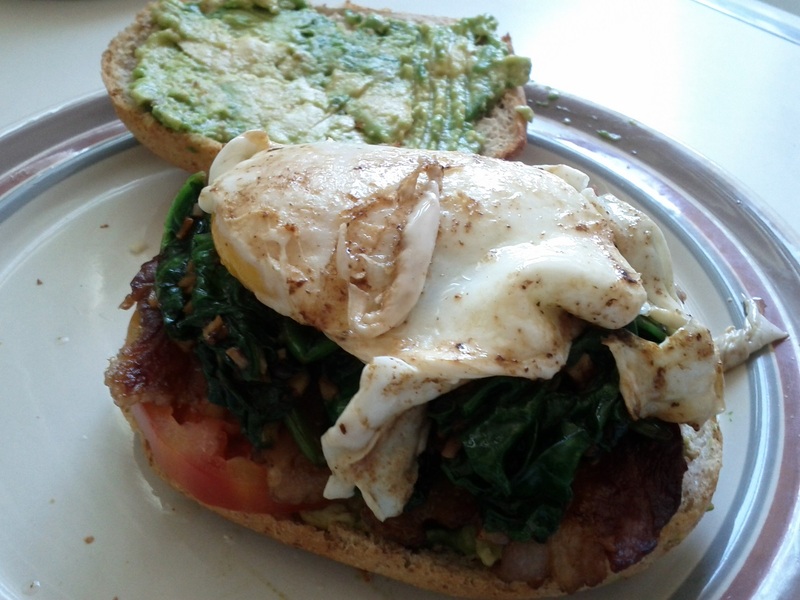 Let me get the bottom line out of the way: this was a tasty sandwich. Beef, greens, tomato, horseradish on crispy ciabatta is a winner, and sweet caramelized onions and horseradish are a fine pair to cap things off. But. Needed more horseradish. It always needs more horseradish, and I’m starting to wonder how that can be. Is horseradish really an ingredient that people enjoy consuming in tepid measure? It is distinct, in the sense that anyone who goes in for it knows what they’re getting. I talk a lot about balance and harmony here and one could accuse me of promoting the opposite here, but what I’m actually advocating is the raising of horseradish to the role of starring ingredient. The lineup above describes a fine sandwich but it is also an exceptionally simple one. Why not let it stand out? Were it up to me I might triple the amount of horseradish involved, name the sandwich after it and be done with it. On Sandwiches, though, is ultimately an exploration of what sandwiches exist, not what sandwiches are possible. 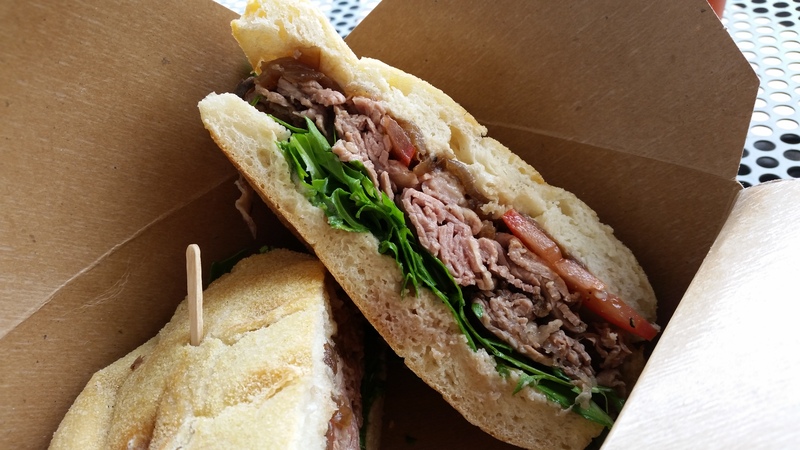 The prime rib at Simple Things stands as so many good-but-uninspiring sandwiches do: without enough horseradish. Gjelina is either an exceptionally lucky establishment, or someone there is a wizard. Out of the more than 400 establishments I have patronized, I have never had a sandwich as well constructed as that one. 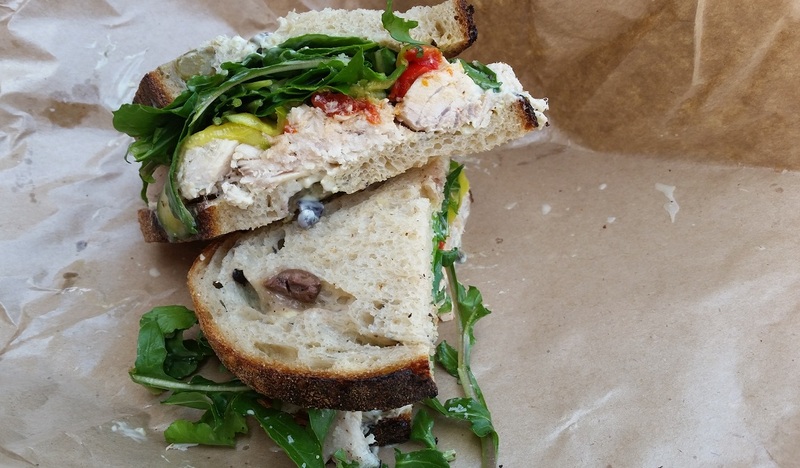 The taste was fine, flavorful tuna, peppery arugula, sweet roasted red pepper and caper aioli is a well-balanced lineup. But the sandwich stayed together from first bite to last, never shifted much, there was absolutely zero filling creep, and each bit of crust was robust but yielded just before the dreaded clamp-and-tear had to be applied. I consider a sandwich successful if it hits even a few of those marks, but to hit all of them is some kind of magic. I’m genuinely unsure of how much credit to award Gjelina because I’m not sure how much of this can be achieved on purpose. How much control does their baker exert over the density of the crust? The air was not especially humid but the ocean wasn’t far; could this same sandwich come together in the inland empire? This is not, I suspect, a question with an answer. No matter. This was a fantastic sandwich, and that much is certain. Simplethings has been featured here before (twice, in fact) and I was recently delighted to find they had opened a branch in Westwood. I happened to arrive on a rather blustery day, cold for Los Angeles, and it seemed the heat of a pulled chicken sandwich was just what I needed. Friends, did this sandwich ever set me right. It’s chicken, arugula, pickled onions, garlic aioli, chevre spread,and chipotle bbq sauce on a pretzel roll. That’s a lineup that might offend some purists, but I’m trying to become less dogmatic in matters like that. So long as everyone executes as well as Simplethings, that shouldn’t be too hard. This sandwich was a delight, and I don’t know if I’ve ever had a sandwich that came together as well as this one did. Aside from the arugula nothing in particular stood out, leaving the sandwich less a series of notes and more a single, harmonious tone. 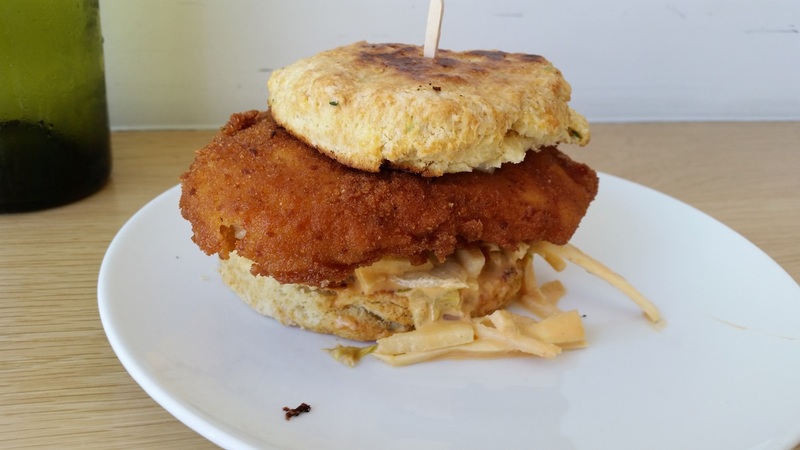 Not every sandwich excels with something like that, but there’s no question this one did. It was rich, balanced, sweet but with some heat to it, and the pretzel roll brought deep flavor of its own. All in all, an excellent sandwich. I’ve had a number of portobello sandwiches lately, some of which I’ve discussed here. I try to vary things, but I also have a special place in my heart for the mushroom sandwich and I think they get short shrift. As such, I intend to just keep talking about them until I feel like more people are eating them, or I see them at more establishments. This is my blog, and I love mushrooms. I’ve featured fundamental LA before, and they make repeat appearances for good reason. They tend to excell in both concept and execution, and the number above is no exception. 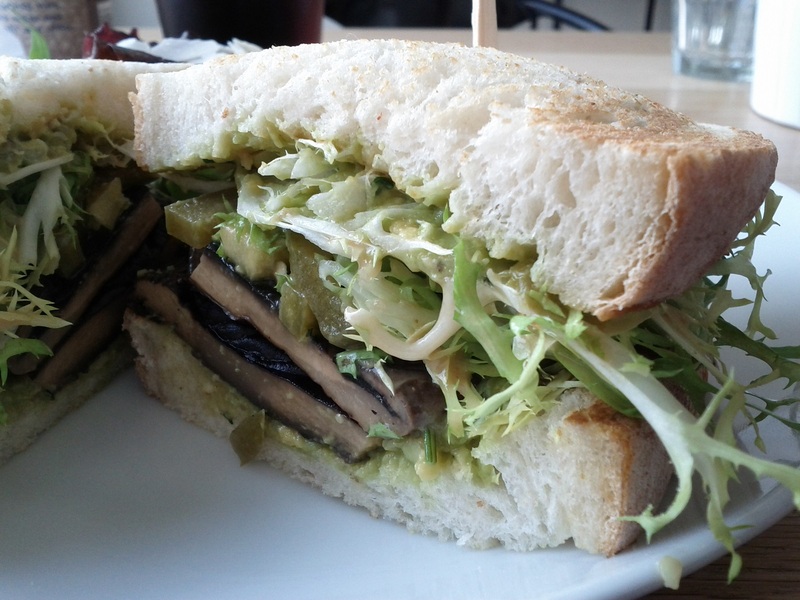 The mushroom is joined by avocado, frisee, pickled jalapeño and miso tahini dressing on toasted sourdough bread. The mushroom and the avocado form a deeply rich duet, the frisee is a delightful textural contrast, and the whole thing packs a substantial flavor. This is a great sandwich, and all the more evidence that if you’re steering clear of mushrooms you’re doing yourself no small disservice. I’m not sure where the grub comes in at Earl’s Gourmet Grub, as the establishment strikes me as fairly typical for a New American eatery. It’s clean as a whistle too, no claim to grub via the greasy spoon. One doesn’t dine on aesthetics, though, so frankly you can call a place whatever you like, so long as the food is good. 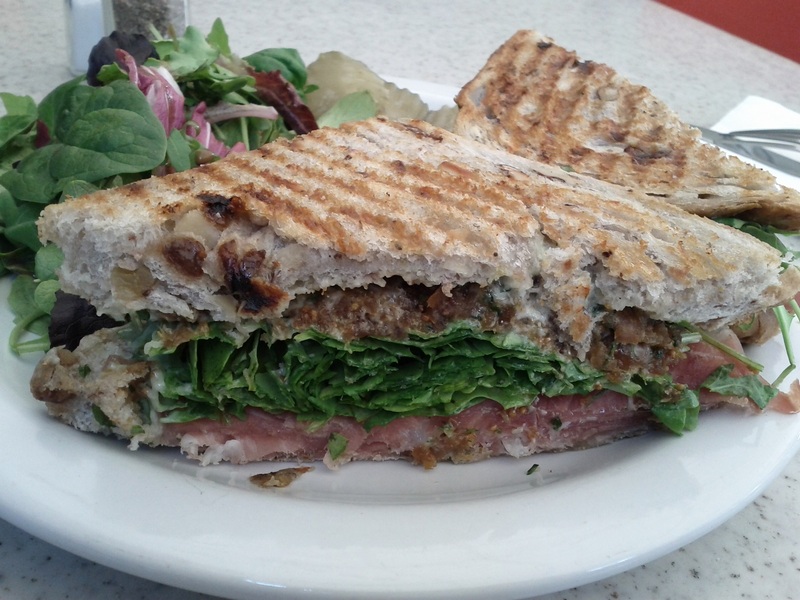 And the fig-n-pig at Earl’s is good: prosciutto di Parma, blue cheese, fig hash and arugula pressed on a nutty whole-grain bread. I found the bites without blue cheese to be preferable to those with, though I could see another individual preferring the opposite. Overall the sandwich works: the prosciutto is rich and salty, the fig hash a sweet balance, and there’s enough arugula there for it to be a full participant, and not a spectator. Too little lettuce is quickly becoming a frequent irritant in my sandwich eating, so when there’s plenty I appreciate it. The bread has an earthy, buttery flavor to it and the press gives the whole thing a crunch. All in all, a fine sandwich. 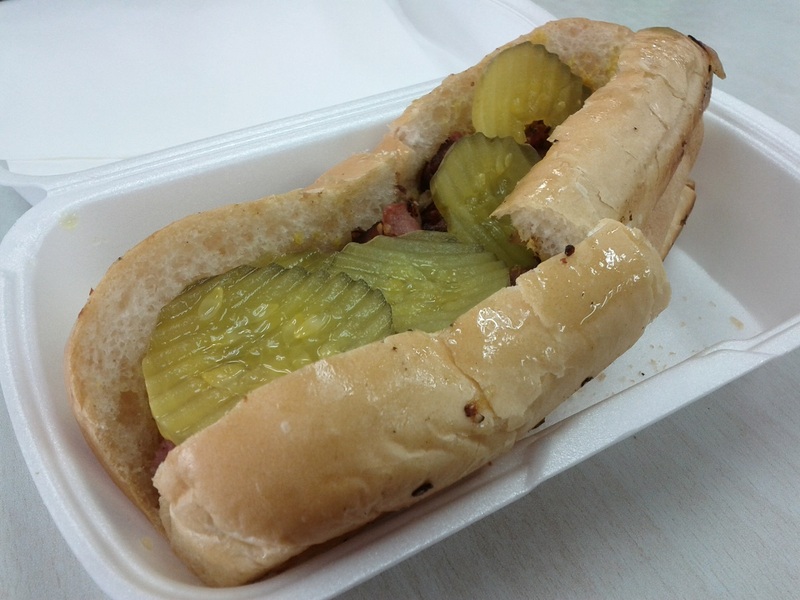 Don’t let the vertical orientation throw you; those pickles were easily pushed on top of the pastrami, easily making a proper sandwich. That’s not the story here. The story is how a sandwich that’s just pastrami, pickles and mustard relies heavily on the quality of the pastrami, and therefore one should have a reliable method for finding above-average pastrami. Luckily, such a method exists. Willie’s Grill and Deli happens to be tucked inside the Alameda Jr. Liquor Market, a clean, well-lit liquor store with an ample selection. That’s a good sign for any sandwich counter. The logic is simple: By joining up with a cash-heavy, usually-profitable business the sandwich counter has access to lower overhead, in the form of cheaper rent when they’re a separate business or just general subsidy when they’re owned by the same people. This takes the pressure off they typically-thin margins of a restaurant, and more often than not that means a bump in the average quality of the food. Things tend to be more fresh, from quality producers, or provided at a better value. That was certainly the case at Willie’s, and it only strengthened my belief that if you’re looking for an above-average sandwich at a modest price, you can do a lot worse than head to a liquor store.